An activity which relates to the specifications of a product. what will be in the next release ? what is the quality of the deliverables ? have all the features being documented ? will the release be ready on time ? in what build do we find this fix ? what's the cost of the release? "Review the dynamock of the module GetLoginID"
Do we have the right people in the team ? in what order should we develop the components ? have we incorporated all tasks in the plan ? are we tracking our estimates in a proper way ? Although both activities are very related to each other, they are also very distinct. iDalko created a concept of "Separation of Specifications and Tasks"(r), and implemented this concept on top of JIRA. Many organizations are using a single dimension approach for managing issues and the tasks necessary to resolve these. This translates into a JIRA setup with one project per product, where bugs are mixed with implementation tasks. In status 'Analyze' the engineer is asked to analyze the problem. The issue will be fixed only if it has been properly planned. Reality strikes again, the developer should be able to indicate that an issue needs more analysis. So a new transition is added. The workflow is being adapted to the actual way of working. You might imagine you end up with a very complex workflow to manage. 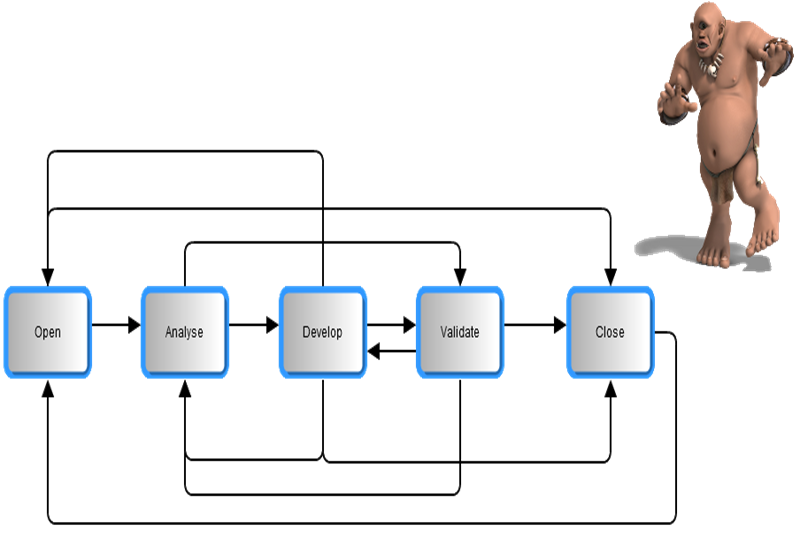 Software development is done in a 'finish-to-finish' fashion where analysis is executed in parallel to implementation. A single dimension model will not be able to represent such way of working. Another example where the single dimension approach is getting into trouble if for instance an issue needs to be handled by multiple teams: in that case a typical approach is to duplicate issues, so that each team can process it separately. This has a significant negative impact as it skews the statistics (number of outstanding issues) and makes the integration of the deliverables of the various teams less transparent. The tracking activity is simplified considerably by separating out the specifications from the tasks. Issues (bugs, improvements, new feature requests, test cases…) are used to track specifications descriptions how the product should (or should not) behave. Tasks (work packages, stories, code reviews…) are used to track work to do. 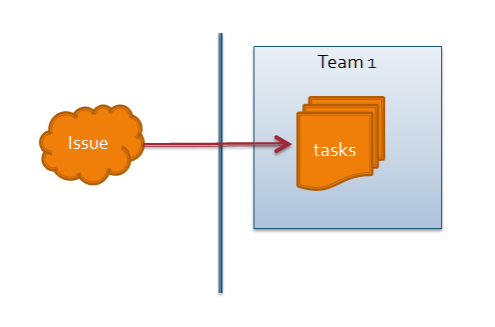 1 issue, multiple tasks in a single team. 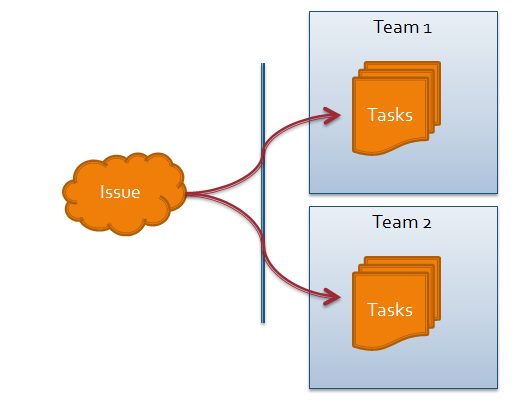 1 issue, multiple tasks in multiple teams. 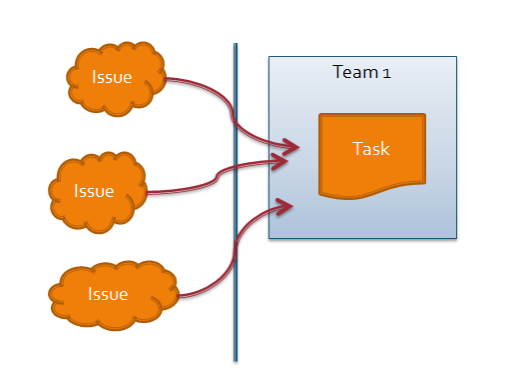 A first example of separating out issues from tasks where multiple tasks are linked to one issue, is depicted in following figure. An issue is only solved, if and only if all related tasks have been solved. Typical example is where one issue needs to be solved on multiple branches. Another example is when a single issue needs to be handled by multiple teams. Each team can manage its own schedule, without the need to duplicate the issue. A third example where the "separation of specifications from tasks" makes sense is when multiple bugs related to the same root cause. Solving the root cause, will address all of the related issues. To implement this model on JIRA, we define 2 types of projects: Release projects and Team projects. A release project is used to track specifications (such as bugs, improvements and so on). The fix version in a release project denotes a release number (such 2.0, 2.3-patch2) Listing all issues solved in a release will be very simple..
A team project is used to track work to do in the form of tasks, work packages, stories, and so on. 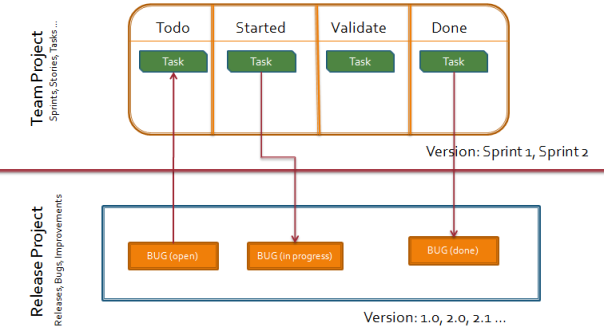 The fix version in a team project denotes a period (such as sprint 10, beta period,...) and is used to group all tasks that needs to be completed in such a period. Using the link feature of JIRA, release issues will be linked to tasks to be executed. An issue is considered to be 'in progress' once that work on one of the tasks linked to that issue has been started. An issue is considered to be resolved, once that all the tasks linked to that issue have been finalized. Auto transition a release issue to 'In progress' once that work on a related task has started. Auto transition a release issue to 'Resolved' once that all work on all related tasks have been completed. Auto transition a release issue back into 'in progress' if additional, unresolved tasks are linked to the release issue. The benefits of separating specifications from tasks should be clear. By managing both issue categories in a separate way, it is possible to improve overall software development activities, including release management and project management. The use of JIRA in combination with the applied automation, provides a cost effective environment to realize a 'multi dimensional issue tracking' tool.